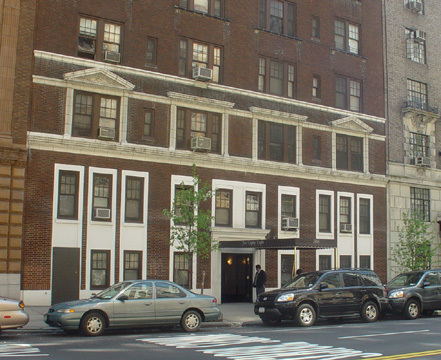 This sprightly, dark-brown brick apartment building was erected in 1922 and converted to a cooperative in 1979. The 15-story, midblock building has 63 apartments was designed by Schwartz & Gross for the West End Corporation. Although the center portion of the facade is plain, the building has nice accents. It has a decorative balcony on the second floor from the top of the building whose center portion is raised slightly above the ends. The lower and top two floors have handsome terracotta window surrounds topped with pediments. Third-story windows have stone enframements with fluted pilasters and the windows have flat pediments at the center and triangular pediments at the end with urns and garlands. Double-height terracotta enframements with decorative spandrels join the 14th and 15th story windows are capped by triangular pediments and the building's parapet is stepped at the center. The site was fomerly occupied by 3 three-story rowhouses. The building has a canopied entrance and a doorman, but no concierge. It has protruding air-conditioners and inconsistent fenestration and no sidewalk landscaping, no health club and no garage.